There is a deep, unhealed historical wound in the UK’s relations with China – a wound that most British people know nothing about, but which causes China great pain. It stems from the destruction in 1860 of the country’s most beautiful palace. It’s been described as China’s ground zero – a place that tells a story of cultural destruction that everyone in China knows about, but hardly anyone outside. The palace’s fate is bitterly resented in Chinese minds and constantly resurfaces in Chinese popular films, angry social media debates, and furious rows about international art sales. And it has left a controversial legacy in British art collections – royal, military, private – full of looted objects. By coincidence, one of the story’s central characters is Lord Elgin – son of the man who removed the so-called “Elgin marbles” from Greece. But there’s a twist – a hidden side to this story – which I’ve been exploring as it involved my ancestor, Thomas Bowlby, one of the first British foreign correspondents. His torture and death at Chinese hands – and the revenge taken by Britain, destroying the old Summer Palace in Beijing in 1860 – was a moment, says one scholar, that “changed world history”. These days the site is just ruins – piles of scorched masonry, lakes with overgrown plants, lawns with a few stones scattered where many buildings once stood. The site swarms with Chinese visitors, taken there as part of a government-sponsored “patriotic education” programme. As everyone in China is taught, it was once the most beautiful collection of architecture and art in the country. 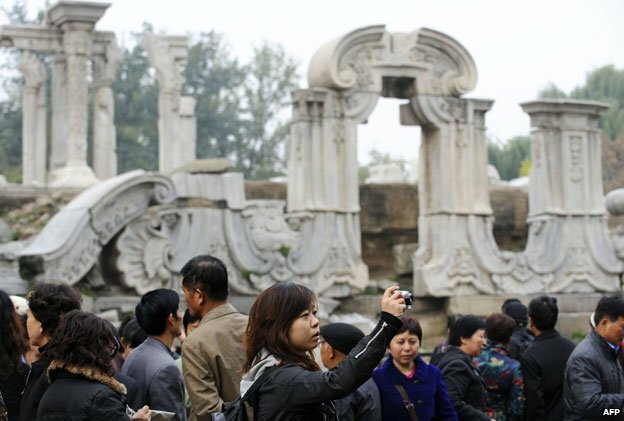 Its Chinese name was Yuanmingyuan – Garden of Perfect Brightness – where Chinese emperors had built a huge complex of palaces and other fine buildings, and filled them with cultural treasures. A new digital reconstruction by a team at Tsinghua University gives a vivid idea of what this extraordinary place looked like when, 155 years ago, a joint British-French army approached Beijing. via BBC News – The palace of shame that makes China angry.